Lawn Fawnatics Challenge #24-Fun with Dies #2! Hello! 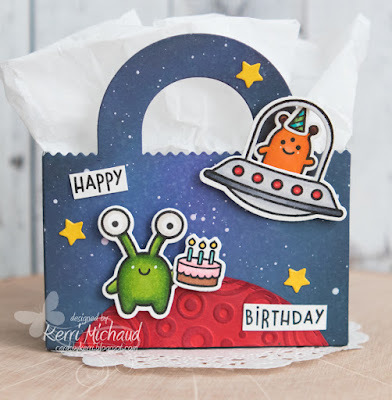 I'm back with another project for the LF Fun with Dies Challenge #24! I couldn't wait to ink up this adorable new Beam Me Up Stamp Set:) I decided to make a fun little gift bag by using the LF Tote Bag Die. I cut it out of white cs and used Wilted Violet, Faded Jeans, and Black Soot Distress Oxide Ink to sponge my sky. I then spritzed with water and finally, flicked some watered down white craft paint all over the bag for the stars. I colored my images with Copic Markers and cut them out with the coordinating Beam Me Up Lawn Cuts. 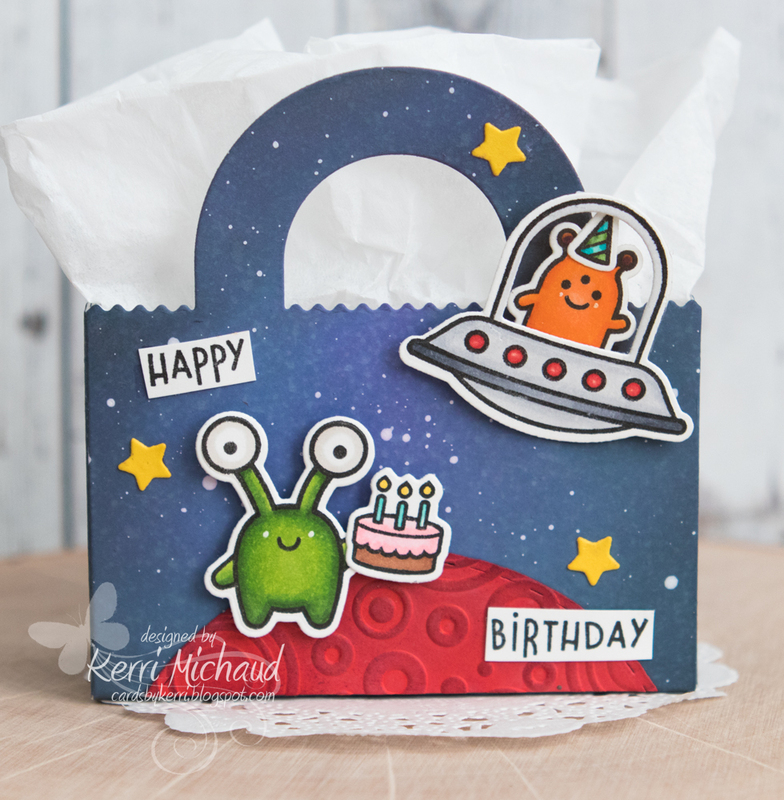 I used a circle die to cut a red planet and the stars are dies from the LF Scalloped Box Card Pop Up Set. I just love these little bags for gift cards:) Thanks for stopping by again! this is fab!! 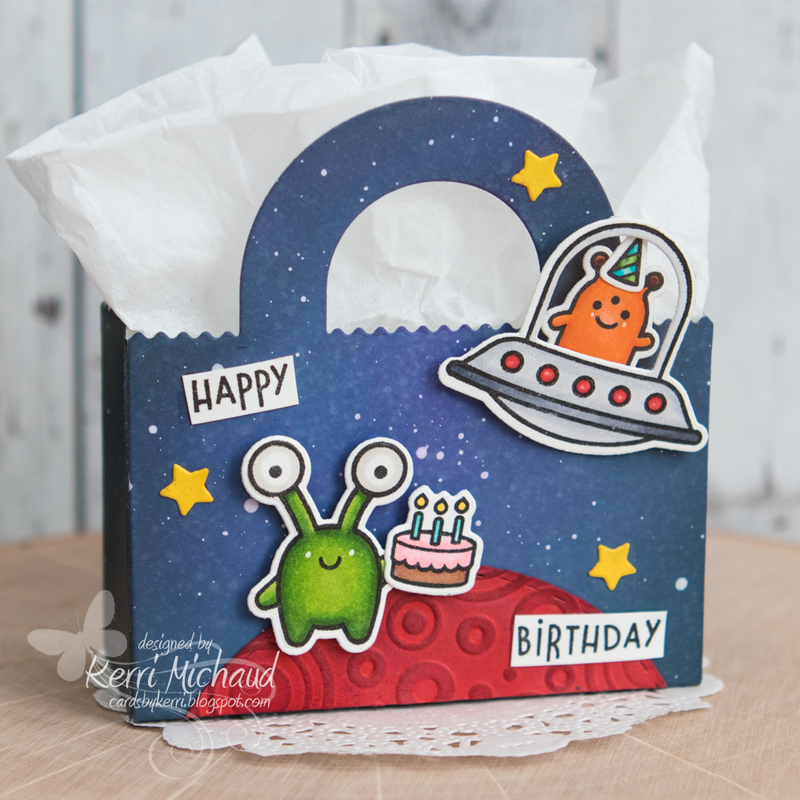 the galaxy background is beautiful and it's a perfect goodie bag for an "out of this world" birthday! Thank u so much for playing with us at Lawn Fawnatics! Adorable! I love your embossing on your planet! Such a fun goodie bag! Thanks so much for playing with us at Lawn Fawnatics!